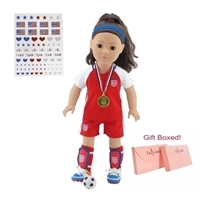 We think your American Girl ® Doll or 18 inch doll wants to be just like you. That's why we have collected doll sports clothes that she can wear while joining you at your lessons, practice, or after-school activities. If you’re a swimmer, we have swimsuits. We also have soccer uniforms, tennis outfits, and much more. We have outfits for nearly every sport you can imagine. 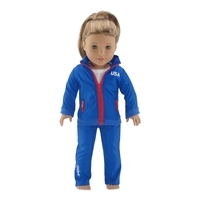 Our doll sports clothes fit all 18 inch soft-bodied dolls, including the American Girl ®, Madame Alexander, Gotz, Our Generation, and Journey Girls.